Chopped potatoes drizzled with olive oil and tossed with plenty of fresh herbs including fresh rosemary, fresh sage and thyme then roasted to a golden crispy delight in the oven. This is a very simple and easy vegetarian and vegan potato side dish. Try it if you need something quick when company's coming or for a worry-free vegan Thanksgiving side dish. Need more reasons to try these simple oven-roasted rosemary and thyme potatoes? Besides the fact that potatoes are cheap and filling for anyone trying to eat or fill up a family on a budget, potatoes with fresh herbs are vegetarian, vegan and gluten-free, and you can get them in the oven just as quickly as you can chop them up and drizzle olive oil on them - there's very little preparation needed. 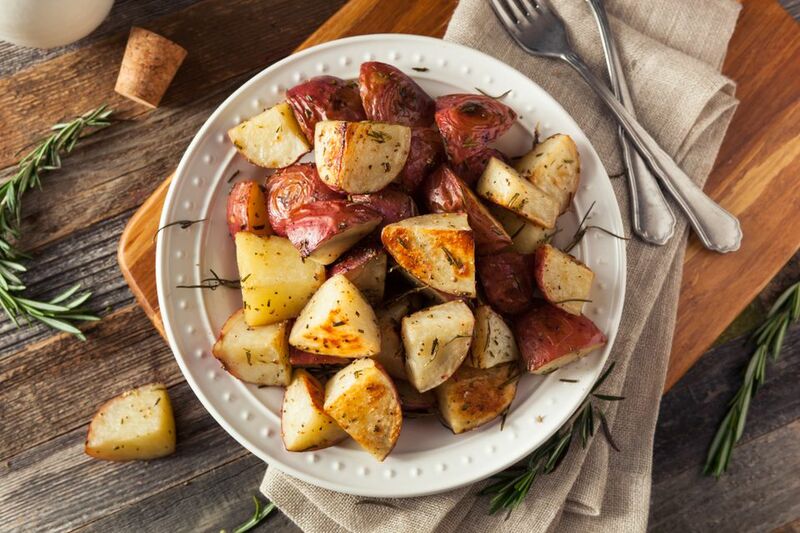 All of the flavor in these roasted potatoes comes from the fresh ingredients themselves — the potatoes, the olive oil and the fresh thyme and rosemary, so be sure to use quality ingredients as much as possible. Regular russet potatoes are just fine in this recipe, but something nicer such as royal blues, fingerlings or red gold potatoes would be even better, and of course, use the best quality olive oil you have on hand. By all means, please use fresh ground black pepper and sea salt or kosher salt instead of regular table salt. Gently scrub your potatoes, then coarsely chop them into chunks about 1-inch big. In a large bowl, gently toss the chopped potatoes with the olive oil until well coated, then transfer to a baking tray and arrange in a single layer. You can drizzle a little bit more olive oil on them if you'd like then sprinkle with sea salt or kosher salt and fresh ground black pepper. Next, sprinkle the potatoes with the minced garlic and the chopped thyme, rosemary and sage. If you're not using fresh sage, feel free to add a little extra thyme and rosemary. Bake your potatoes in the oven for 30 minutes and then carefully remove and gently toss the potatoes; bake for another 30 minutes until lightly golden brown.